TORONTO, Jan. 14, 2019 /CNW/ - Namibian lithium developer Desert Lion Energy Inc. (TSXV: DLI) (OTCQB: DSLEF) ("Desert Lion" or the "Company") has initiated the Company's 2019 exploration and development program. The program will focus on increasing and optimizing existing Mineral Resources Estimates ("MRE") and advancement of the mine, concentrator and lithium conversion plant in Walvis Bay. Following the completion of the financing announced on December 4, 2018, the Company is progressing with the next phase of exploration and development work to advance the Desert Lion Energy Lithium project. The next phase of exploration and evaluation work will focus on increasing the existing MRE as well as the confidence therein, as well continuing with grassroots exploration over the Company's EPL's. The following activities are planned for the first half of 2019. 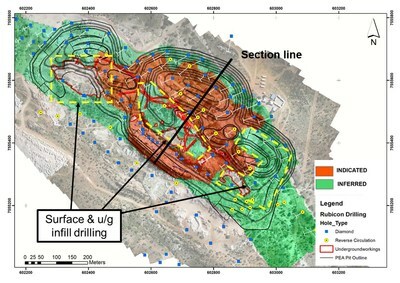 Completion of a Geotechnical Evaluation to optimize existing Preliminary Economic Assessment ("PEA") pit outlines and to optimize the Mine Plan. 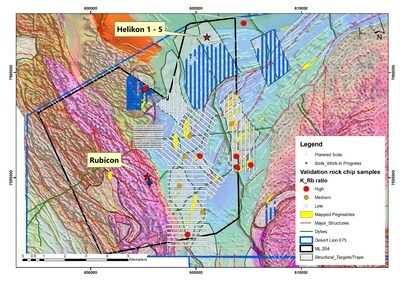 Completion of a Geotechnical Evaluation to optimize existing PEA pit outlines and to optimize the Mine Plan. Following completion of the infill drilling programs, the Company will be updating the Mineral Resource Estimate, with results anticipated in Q3 2019. Commencement of follow up work over the structural targets generated in 2017 will continue in 2019 and will comprise of detailed soil geochemical surveys over prioritized targets and follow up mapping and sampling of LCT pegmatites discovered in 2017. The objective of the program is to generate drill ready targets for the second half 2019. The results of the study are expected to be published in late Q2 2019.